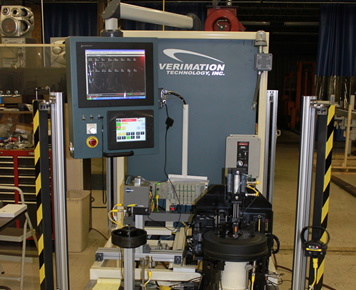 Semi Auto Systems - Verimation Technology Inc.
Verimation will design and build a CUSTOM Semi-Automatic Gauging System for you. All of the advanced features and robustness of a Full Automatic System will be built in. The only difference that is notable is; these systems are generally hand loaded and unloaded. Be assured that your operator will be well protected. Dynamic types of guarding are used. Light curtains and / or Optical switches are implemented in a manner that keeps your operators in the “Safe Zone” These systems can be used for full production and are also very beneficial when used as audit stations. 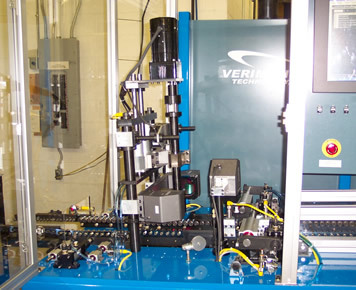 All the capabilities of the Verimet U1000 software are available, including Data Stores to retain your measurement data.